Now to make your Bold Predictions for the Gardner-Webb game. Same as always, leave your picks in the comments section. 1. Kenny Cook and Darrin Peterson combine for 300+ yards. Why this is bold- Cook and Peterson average a combined 211 yards per game. Why it will happen- Cook is just now starting to get hot this year, and is coming off a 251-yard performance against VMI last week. Neither team’s secondary deserves much respect, and the best two wide receivers in the Big South will have a feasting at their expense on Saturday. 2. Either Josh Woodrum or Lucas Beatty will win Big South Offensive Player of the Week. Why this is bold- There are six Big South teams in action this week. The odds are not in Woodrum or Beatty’s favor. Why it will happen- Woodrum and Beatty are averaging 271 and 230 yards passing respectively. These are two of the best QBs the Big South has to offer, and they should have good days in a game that won’t involve a ton of defense. 3. D.J. Abnar gains more yards in any quarter than Juanne Blount rushes for all game. 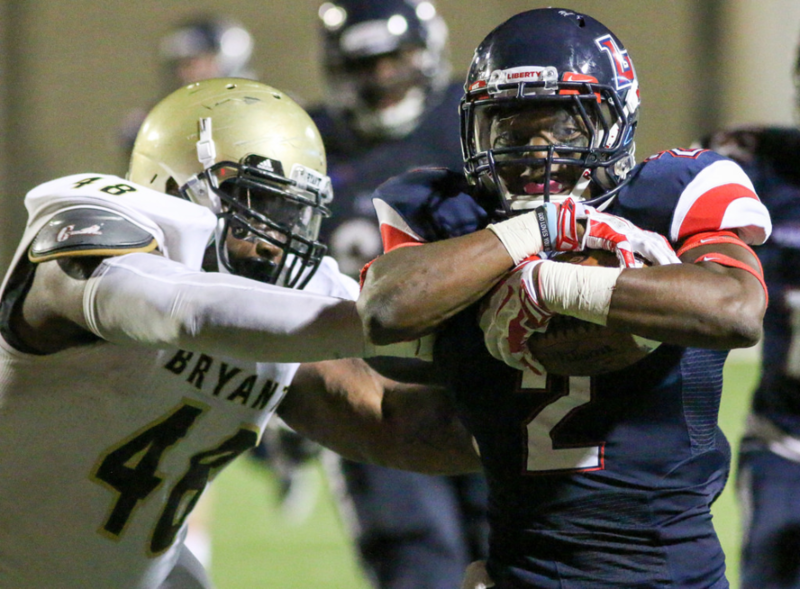 Why this is bold- Blount is G-Webb’s leading rusher, averaging 46 rushing yards per game. Why it will happen- Abnar is averaging 101 yards per game. He definitely could explode one quarter and eclipse Blount’s total with a few big plays. 4. O.J. Mau gets 2+ tackles for loss. 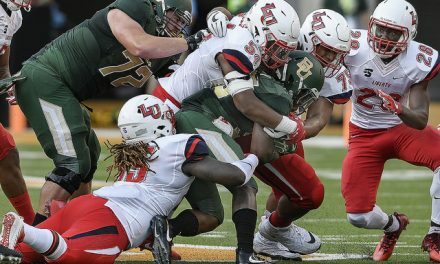 Why this is bold- Liberty’s O-line has been solid this year. It will be tough for Mau to beat them twice. Why it will happen- Mau has been a beast this year, with eight total tackles for loss on the season. 5. There will be more touchdowns than penalties. 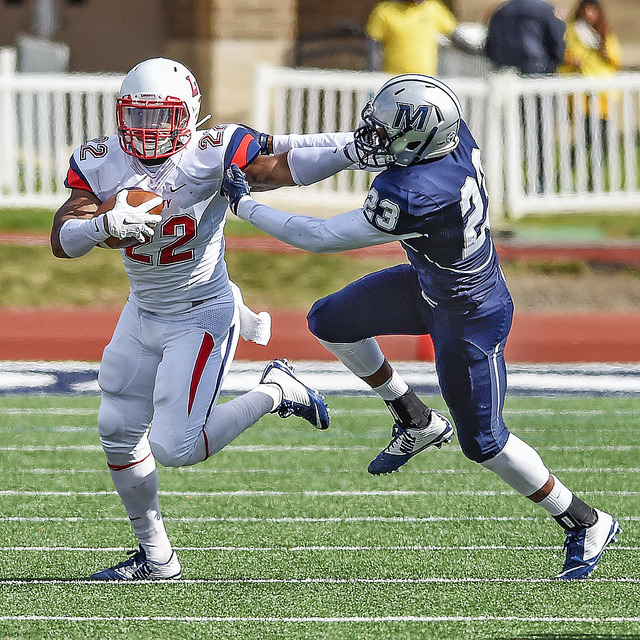 Why this is bold- Liberty’s opponents have scored 32 touchdowns and had 47 penalties called on them this year. Why it will happen- Liberty has had a much better TD/penalty ratio though. 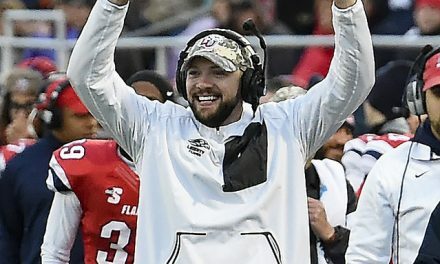 The Flames have scored 33 touchdowns while getting called for 34 penalties. There should be a lot of TD’s, so why not? 6. Liberty returns a kickoff past the 50. Why this is bold- The Flames have had some major kickoff woes this year. The longest kickoff return we’ve had all year was 35 yards and Liberty is averaging a laughable 16.4 yards per return this year. Why it will happen- We are so due. We have some playmakers; they just haven’t made that big play yet. Maybe this will be the week. Bonus 1. (5 points): Who will be the game’s leading scorer? Bonus 2. (5 points): How many total points will be scored? Pick a range of 10 numbers. For example 40-50 or 34-44. Submit your picks by 11:59 P.M. on Friday. 2, 3, 5. Bonus 1 – B. Bonus 2 – 66-76.